TASHKENT (RFE/RL) — Uzbek authorities have released a U.S. citizen who was detained on suspicion of joining a terrorist group and fighting alongside Islamist insurgents in Afghanistan. Zokir Aliev told RFE/RL on June 23 that he was released a day earlier but ordered not to leave Uzbekistan while investigations continue. Aliev was detained on June 16, about an hour after he arrived in his native city of Qarshi in the southern Qashqadaryo region. On June 18, the State Security Service stated that Aliev was detained on terrorism-related charges, alleging that Aliev joined the Islamic Movement of Uzbekistan (IMU) in 2000 and took part in attacks against Afghan armed forces and NATO-led coalition troops in Afghanistan. The IMU has been designated as a terrorist group and banned in countries including Uzbekistan, the United States, Britain, Australia, Canada, and Russia. Aliev, 46, left Uzbekistan 25 years ago and works for a private tax-services company in the United States. According to him, he entered Uzbekistan legally on a 90-day visa that he obtained at the Uzbek Embassy in the United States after receiving an official invitation from his relatives. He pretends that he had never been in Afghanistan and had never supported Islamic extremists. He said to RFE/RL correspondent that he had not seen his relatives in many years and decided to make the trip after President Shavkat Mirziyoev called for the return of the Uzbeks who left the country in the years after the Soviet Union collapsed in 1991. 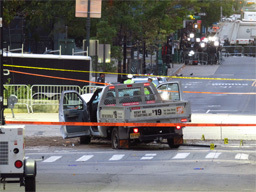 The Home Depot rental truck used by perpetrator Sayfullo Habibullaevich Saipov during the 2017 Lower Manhattan attack, the morning after the incident. Sayfullo Saipov who committed the New York terror attack on October of last year, was from Uzbekistan, a country with a history of religious violence — and one whose citizens are susceptible to ISIS propaganda and recruiting efforts. Saipov seems to have been radicalized after he came to the United States, and not back in Uzbekistan. But ISIS and other militant groups have been actively recruiting Uzbek migrant workers in the US, Russia, and Europe. A two-year U.S. federal terrorism investigation led to charges against five men from Uzbekistan, and another from Kazakhstan, for providing “material support” to ISIS. Uzbeks have also conducted attacks in Russia, Turkey, and Sweden over the past year, killing 57 people.